My column in today's The Canberra Times was devoted to typewriters. It can be accessed here. One good turn begets another, I was told as a child. My joy in the past week, at discovering just how true this can be, has been positively childlike. Last year a lady called Polly contacted me, saying she and her husband Tony had bought their early teens daughter, Frances, a typewriter, and asked if I knew anyone who could service it. Delighted to hear a young local teen wanted to use a big old manual typewriter (it’s an Olivetti Diaspron, by the way) I offered to do it myself. The family were delighted with the result. A few weeks ago, however, I learned that, through an accident, the Diaspron was no longer working. The family bought the machine to me to see if I could fix it. Taking it apart, I realised just how well Marcello Nizzoli had designed this model – and why it was so successful, in its time, as an office typewriter. I sought advice from my friend Derrick Brown, in Brisbane, who at one time was a trainer for Olivetti technicians. He warned me, from personal experience, to be wary of the drawband, which is made of razor-sharp steel and can tear one to bits if it gets loose. Anyway, Derrick’s help, and my own knowledge of the intricate workings of a typewriter, proved to no avail. The main pawl mechanism had been mangled and the carriage was jammed tight on the escapement rack. 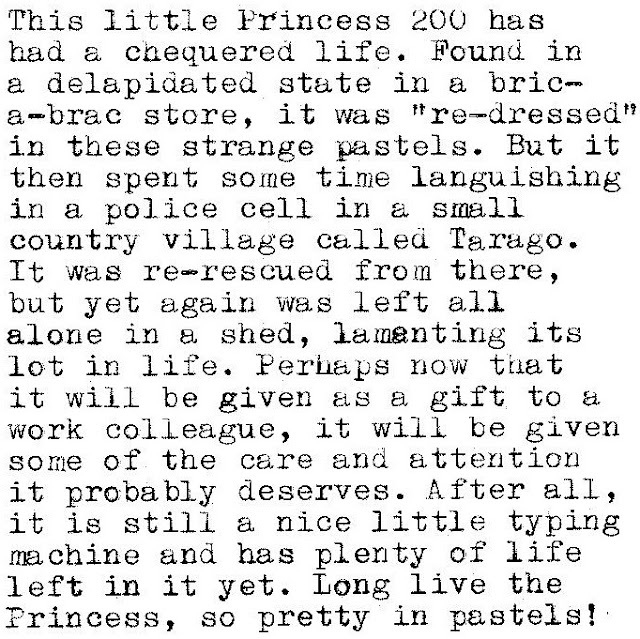 Very few things can happen to a typewriter to stop it from ever working again, but this was one of them. There was nothing that could be done. By sheer coincidence, I was contacted by a lady called Dorothy, of Holt, who many years ago had acquired a typewriter when the Kurrajong Hotel was offloading “old technology”. Dorothy was “downsizing”, as so many Canberrans seem to be these days, She asked if I knew where a good home could be found for her machine. Guess what? It was a Diaspron. I got in touch with Polly again, and not long after Frances had a “new” old typewriter to use. Acting as no more than the middleman in all this seemed to instantly bring me extraordinary good fortune. In the next three days, my collection increased by 12 beautiful typewriters, seven of them given to me by Canberrans cleaning up house or downsizing. Often I suspect that whenever I mention typewriters in this column, or readers spot them in the backdrop of the dinkus at the top of this page, they remember they have an old typewriter which needs a good home. The email address at the bottom of the column obviously comes in handy in that regard. Readers were incredibly generous to me during last week’s bountiful period, a happy spell I referred to on my typewriter history blog as raining “typewriters from heaven”. First, Richard, of Palmerston, dropped over a lovely little Lemair De Luxe 1510, a model I hadn’t seen before. Then Nicola, of Deakin, got in touch about an Imperial 2002 (I hadn’t previously been aware of such a model) and a Facit TP2. It so happens that the very day Nicola messaged me, I was involved in discussions on the “typosphere” about the virtues of the Facit TP2, as many of us had been singing the praises of the earlier Swedish model, and wondering how Facit could have improved on this with the later TP2. But none of us had a TP2 – that is, until Nicola by chance provided. The next day I picked up an Underwood Universal from Bill McKay, of Forrest. I have a particular fondness for this typewriter, as it was the first one I ever used: my father was upgrading his office equipment, and gave me his old Universal when I was nine, in 1957. Bill’s belonged to his father, Canberra’s first veterinary surgeon, Angus Conrad McKay, Angus was appointed in 1926 by the Federal Capital Commission and made responsible for supervising the supply of meat and milk and for providing disease control and advice to livestock producers throughout the territory. Bill showed me the magnificent rolltop typewriter desk at which his father had used the Underwood. A wooden tray was pulled out from above the drawers on the right side of the desk, on which to place the machine. Bill suspects the desk was made in Sydney, but I had not so long previously been drooling over old advertisements for just such typewriter furniture, made by the Moon Desk Company in a place called Muskegon, Michigan. No sooner had I got home from Bill’s house than I received a message from Tom Roberts, of Reid. Tom had been reading my column about the Guinea Gold wartime newspaper, and said that as a former newsagent he knew Ted Glover, the Gold’s immediate post-war editor. Just as importantly, reading the column had reminded him to ask whether I would be interested in his father’s old typewriter. It is a Tradition 3, an extremely rare export version of an early German Olympia portable typewriter. Tom also had an Olympia Splendid that needed a new home. I apologise for going on about typewriters, but I have done so as an excuse, if such a thing is needed, for illustrating just how remarkably kind Canberrans can be. Thank you so much Dorothy, Richard, Nicola, Bill and Tom. Yelp - That pink Princess is too princessy for my eyes - I prefer the more manly Khaki" on my machine. Yes, I agree, Florian, it is princessy; I note there is a consensus among comments to your post about not wanting to see it in pink! Ooops, too late! Yes, it is to a young female reporter to whom it has gone. I did warn her about the colours, and she did say it looked "very girlie", but she seemed to be absolutely delighted with it nonetheless. The Pink Panther Oliver also went to a young female reporter, whose desk was covered in pink things, so I thought that appropriate. That is so very girly and sweet. I think it's nice for a girl. I would prefer a nice green or purple, myself.